Whispers in the Loggia: "As a People Made One"
The briefest Installation Mass preach these shores have seen in quite some time (16 minutes, all told), here below is the prepared homily of the freshly-installed Archbishop Robert Carlson of St Louis, with fullaudio for the mp3 inclined... and pictures for the shutterbugs. 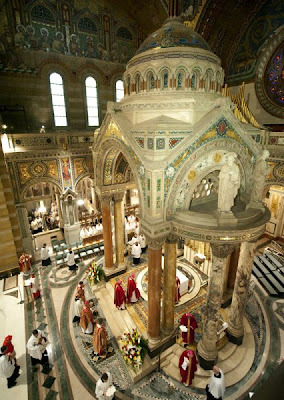 Today the Church of St. Louis gathers at Eucharist in this historic cathedral and we pray and sing: "Lord, send out your Spirit, and renew the face of the earth." I greet you all with great affection in the Lord, and I thank you for the warm welcome you have provided for me, my family and guests and those special friends who join me from the Archdiocese of Saint Paul and Minneapolis, the Diocese of Sioux Falls and the Diocese of Saginaw. 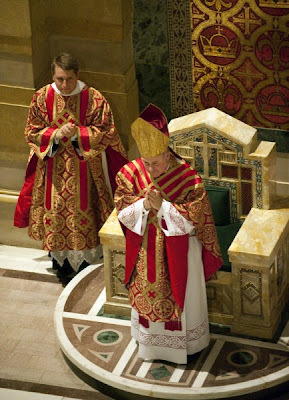 I feel greatly blessed by his Holiness Pope Benedict XVI to be your new archbishop and I give thanks for all the blessings of the past and pray that I am open, with the support of your prayers, to the gentle promptings of the Holy Spirit in the future. In a special way I would like to recognize and honor his Eminence Justin Cardinal Rigali, the seventh archbishop of St. Louis and now the archbishop of Philadelphia, who is present here today to install me; and Archbishop Raymond Burke, the eighth archbishop and now the prefect of the Apostolic Signatura in Rome, who was kind enough to join us for this ceremony. Archbishops, welcome home! I would also like to recognize and thank Msgr. Alexander Cifuentes Castano the first secretary of the Apostolic Nunciature, representing Archbishop Pietro Sambi, the apostolic nuncio to the United States. For this Mass of Installation I have chosen a Votive Mass of the Holy Spirit that we might give thanks for the blessings of all those who went before us announcing the Good News and enriching the Body of Christ, and at the same time, looking to the challenges of the future, that we might prayerfully listen to the gentle promptings of the Holy Spirit in our day. We call to mind the words of St. Cyprian and ask God for the grace to attain it — "The whole Church has been seen as a people made one with the unity of the Father, the Son and the Holy Spirit." Along the way we might have our differences, but we are the Body of Christ. 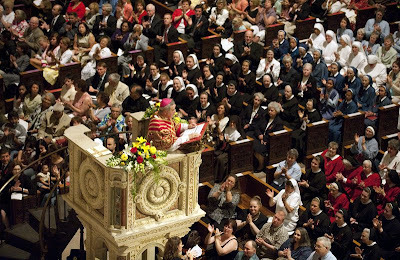 How blessed we are in the Archdiocese of St. Louis with so many gifts: among them a strong Catholic school system, contemplative and active religious communities, dynamic outreach to the poor, excellent Catholic health care, the presence of a diocesan seminary and a commitment to evangelization. 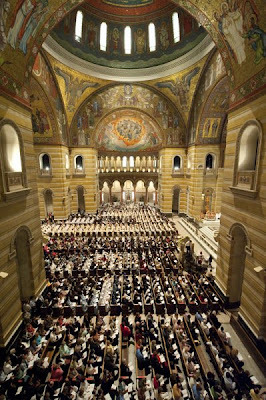 The Archdiocese of St. Louis is sometimes referred to as the "Rome of the West" because of the large number of religious communities found here. With your vowed commitment to poverty, chastity and obedience you teach us all how to live after the mind of Christ, we grow richer for your witness and I treasure your presence. I look forward to discovering how the Holy Spirit is working through each one of you and I pray: "Come, Holy Spirit, fill the hearts of your faithful and enkindle in them the fire of your love." As the Holy Spirit is poured out upon us, we come to share ever more deeply in the life and mission of Christ — and His glory becomes our glory. But the glory of Christ is the cross! Therefore, if we want to share in the glory of Christ we must do what He tells us in today's Gospel: Take up our cross and follow Him. I can tell you from my experience — and you know from your own — it is no easy task! But we can strengthen and encourage each other if we do it together. In our words and deeds, day by day, let us stand together and say to the world: We are followers of Jesus Christ. As I prepare to become the pastor of this local Church, I ask for your prayers that I might be a good shepherd — a spiritual father who sees as his first duty to grow in holiness of life and by tasting the Father’s love for me dare to proclaim the Gospel of Jesus Christ with joy and hope. May I never be afraid to challenge the secular culture, which is growing everyday more indifference to the teachings of Jesus Christ, especially on the life issues. We will never compromise our commitment to life! As Pope Benedict XVI said during his pastoral visit to the United States, ''For true life --- our salvation --- can only be found in the reconciliation, freedom and love which are God's gracious gift. This is the message of hope we are called to proclaim and embody in a world where self-centeredness, greed, violence, and cynicism so often seem to choke the fragile growth of grace in people's hearts." I have a deep love for priesthood and a profound love for priests. Brothers, you will be my closest collaborators in ministry. I promise to pray for you, to support you, listen to you, be open to your differing opinions and grow in friendship with you. I commit myself to raising up new and worthy vocations and look forward to collaborating with you in this important work. 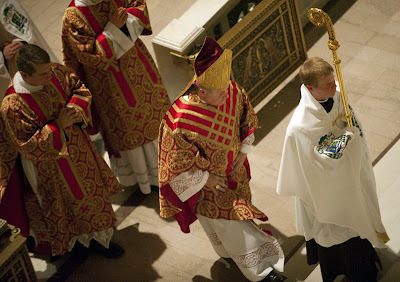 I will never ordain a man a priest that I do not know. One of the special blessings I have known as priest and bishop is being part of the life of our parish communities. I look forward to coming to know the great people of this archdiocese and discovering ways I can support you on the journey. I have been privileged in my 39-plus years as a priest and 25 years as a bishop to be part of families in moments of great joy and great sorrow. I stand ready to serve you and respond to your needs. I look forward to working with your friends and neighbors in the civic community and walking with the members of the ecumenical community in order to respond to the needs of our day. May your prayerful support and my hope in Jesus Christ fill my heart with compassion, allowing me to draw near to all those who suffer and allow me to bind up the wounds of the poor and build bridges with the alienated as I serve Christ as His disciple and a friend to all.